today the weather is fabulous. When I saw these Cowboys I knew I wanted to set a table to celebrate Rodeo Week. Would you believe the Cowboys are Christmas tree ornaments? Yep!!! I bought them at Macy's after Christmas on sale. 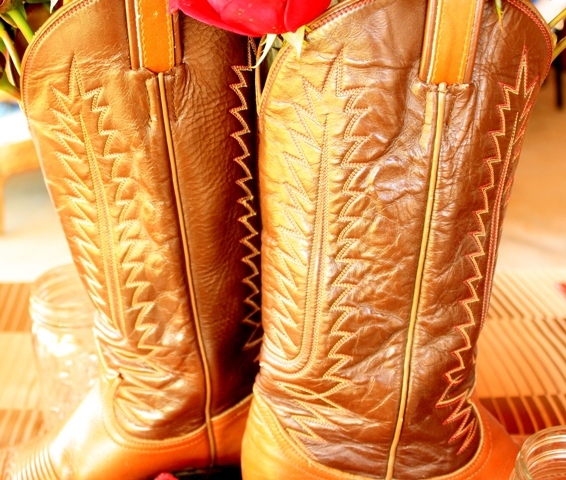 I love my Cowboy Boots. I wear them once a year during Rodeo Week. On Friday morning the Rodeo Committee holds an annual pancake breakfast from 5 until 10 in the morning. Serving over 10,000 people. It's Amazing!!! On Friday night I wear my Cowboy boots to the Rodeo. It's awesome fun to watch the clowns and the animals. And the cowboys riding and roping. When I go to the Rodeo I feel just like a Cowgirl From the old West. 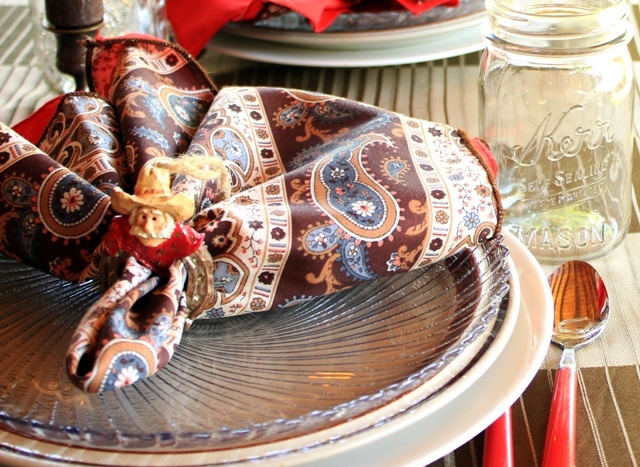 The color of the printed napkin reminds me of an old Western blanket and the Red napkin accents the beautiful Don Juan Roses. 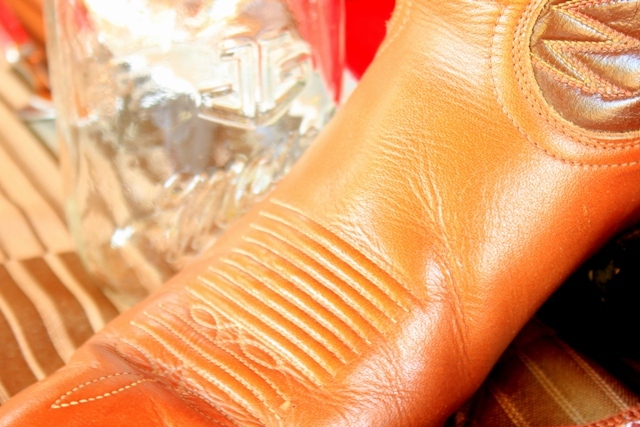 What a great texture these old boots have. And beautifully worn with age. How about a cold drink in a Mason jar? Ride 'Em Cowboy / Don't let em throw you down / You can't make no money If you hit the ground. Please link back to see amazing things. Please join in the fun!!!! 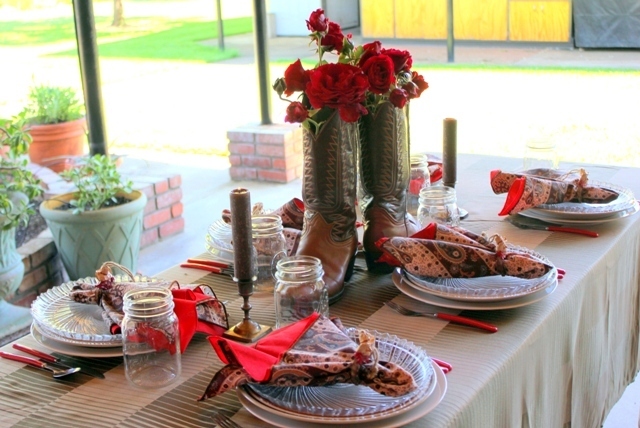 I love your cowboy tablescape - especially the boots filled with roses and those adorable cowboy "napkin rings." Oh my, I just couldn't resist those boots. Your table is spectacular!! Now I'm really inspired. Absolutely adorable! 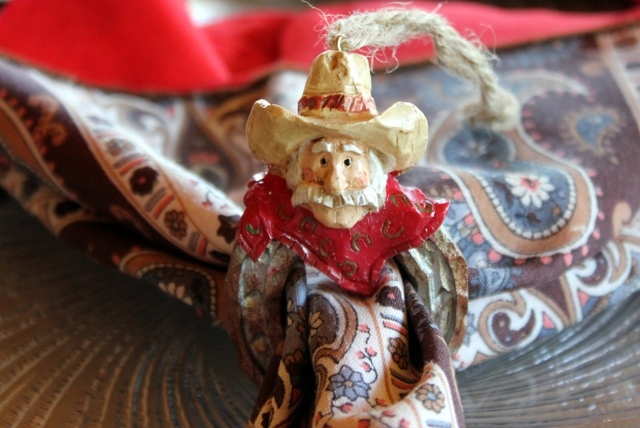 I love your cowboys, what a smart idea to find those Christmas Ornaments :)And your boots are so cool! 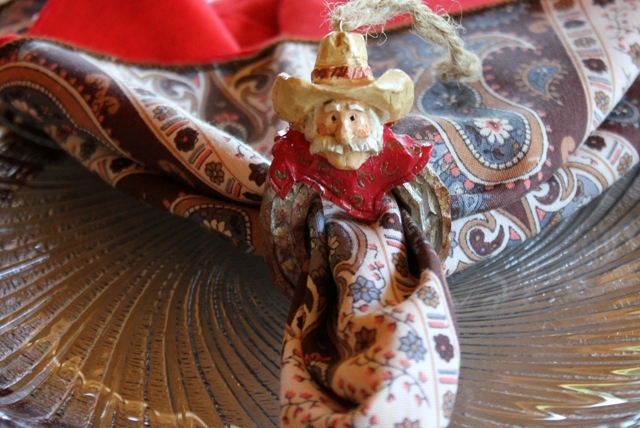 Your cowboy festival sounds like a lot of fun- especially the breakfast. Thanks for sharing such a great table. Well Little Lady, (said with a John Wayne Drawl)giggle giggle.... I think you just might have yourself a winner with this one!! :) I just love it Betty!! 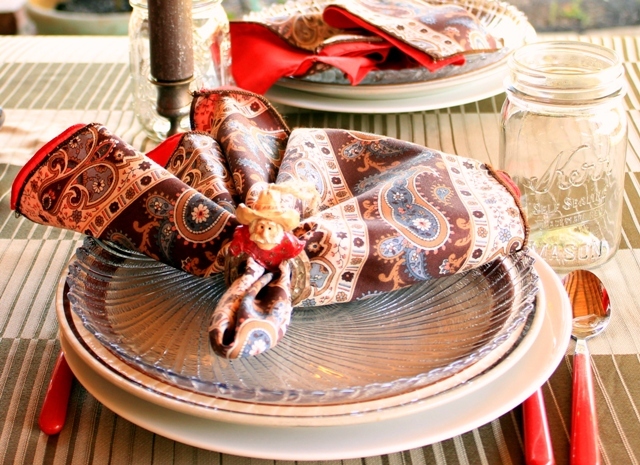 How creative to use the Christmas ornaments as napkin rings! Thank you for sharing and enjoy your festival!! Hope your weekend is Plum Perfect!! Great decoration! 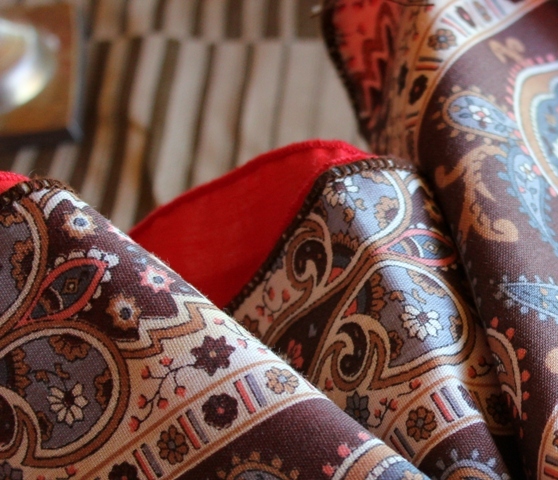 Enjoying every detail! Thanks for sharing! Howdy too! 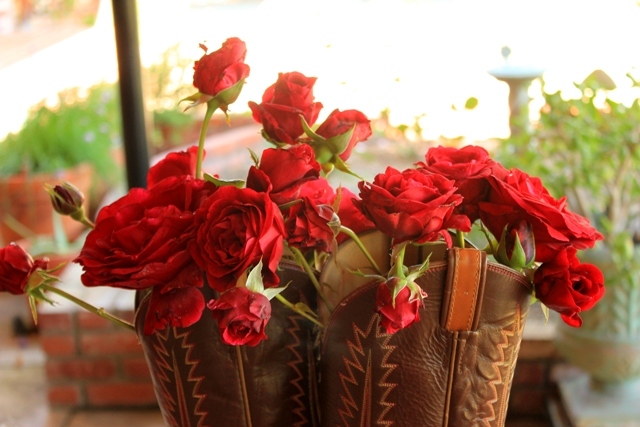 I love your boots, they have a beautiful design to them! 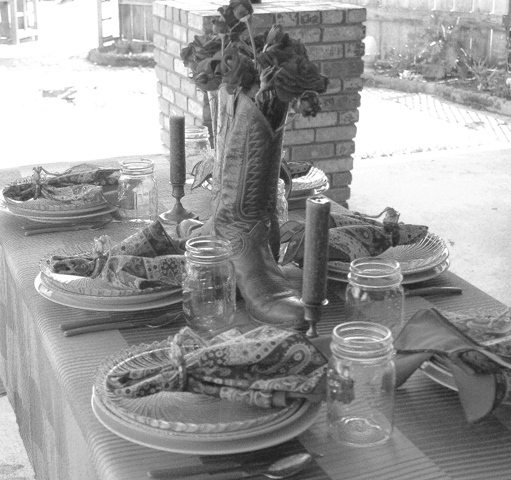 I love it that you made them a centerpiece for a rodeo your beautiful, fun table. Thank you for ciming by and for the lovely comment. Have a wonderful time at this great festival, ya'ol!!! What a fun table! 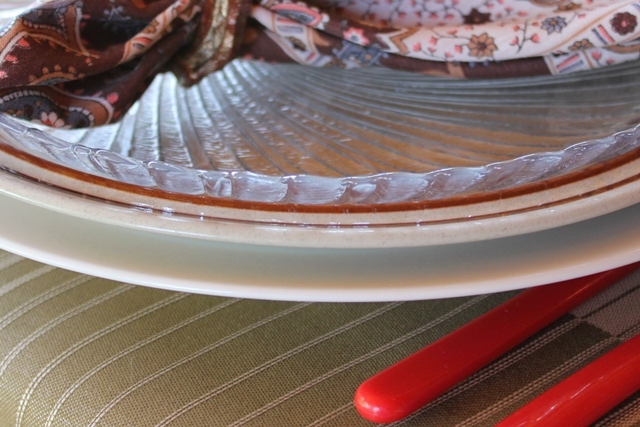 Love the napkin rings. Hi Betty, It's nice to meet you. Your table is so fun and cozy. Your boots look like my Nicona's. They are the most comfortable boots I own. What a fun tablescape! 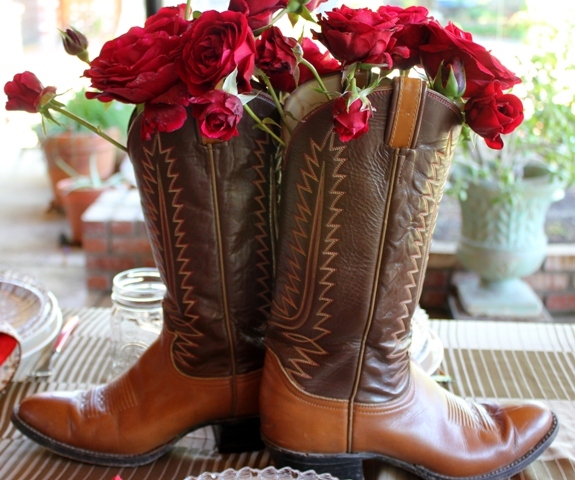 I love those roses dripping out of the cowboy boots. How beautiful! Thanks for linking this up!